Credit Suisse gold bullion bars come in a variety of sizes ranging from 1 gram to 1 full troy ounce of pure gold to satisfy investors from all over the world. 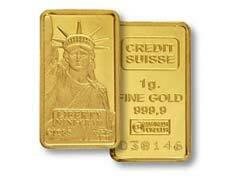 Credit Suisse gold bar bullions are made of the purest form of gold available on the market, 24 karats. Each Credit Suisse gold bullion bar is proudly stamped with the well recognized Credit Suisse’s logo and marked according to its weight and gold purity. For gold investors in the United States, a 1 oz Credit Suisse gold bullion bar is perhaps the most popular choice guaranteeing absolute liquidity for their gold investment. Additionally, since each Credit Suisse gold bullion bar comes with its individual assay certificate attached, you are going to avoid extra assaying costs down the road that some investors might encounter should they decide to sell other types of gold bars that do not come with such certificates. There’s just no denying it that Credit Suisse gold bullion bars are simply the best choice when it comes to investment in physical gold. If you compare prices on similar 1 oz gold bullion bars, you will realize that there are no matches to Credit Suisse gold bullion bars in price or in its superb quality and reputation. PAMP Suisse is another highly reputable mint located in Switzerland that produces world’s renowned bars that come with incredible high quality finishes. Consider adding PAMP Suisse gold bullion bars to your gold portfolio due to the finest Swiss standards that are widely recognized and cherished all over the world.